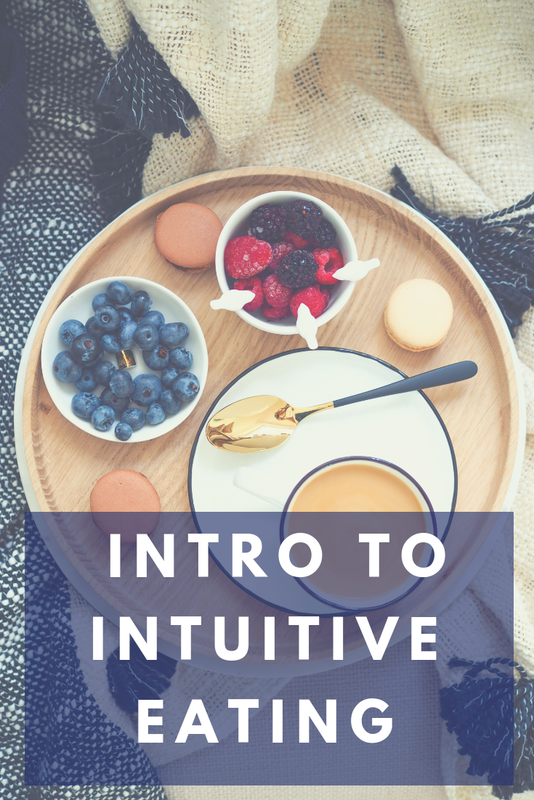 Have you heard about Intuitive Eating but aren’t quite sure what it means? Intuitive Eating (IE) is a flexible, non-diet approach to eating and exercise that considers physical, mental, and emotional health. The IE framework was developed by registered dietitian nutritionists Evelyn Tribole and Elyse Resch after many years of working with nutrition clients and witnessing their struggles with dieting, weight loss (and regain), and body image. From the cover of the Intuitive Eating book by Tribole and Resch, IE helps people “make peace with food, free yourself from chronic dieting forever, and rediscover the pleasures of eating.” Learning and practicing the principles of IE helps people to tune out external messages about what and how much they should eat and tune into their personal hunger, fullness, and feelings of satisfaction with food. We are born natural intuitive eaters until we learn and internalize food rules set by our (usually well-meaning) parents and later, diet gurus and weight loss companies, media, advertising, and peers. For many people this causes distrust and distress with their bodies and food. Practicing IE helps people get back into attunement with their bodies so they can stop stressing about food and focus on other things that give them meaning and satisfaction in life. There are ten principles of Intuitive Eating that guide people to relearn trust in their bodies and the joy of eating. I plan to write more about each principle and how you can start applying them in future posts! Learning more about IE and a weight-neutral approach to health has changed the way I practice nutrition for the better. My education and training in dietetics and nutrition didn’t really prepare me for all of the shame and guilt so many people have about food and their bodies. No amount of meal plans, calorie tracking, or education on portion sizes can fix that, even if that’s what people ask for. In fact, it just makes most people feel worse when they can’t follow a plan and reinforces a restrictive mindset about food. People tend to start thinking they’re the problem--they’re just not trying hard enough or something is wrong with them. I became a dietitian to help people reach optimal health--however that looks for them--while enjoying food and this wasn’t the way. I needed and sought out more knowledge and training in navigating the complex emotions that come up in nutrition counseling. This is when I learned about the concept of Intuitive Eating and immediately bought the book. After reading the book I also delved into courses, podcasts, weight science research, eating psychology, and numerous blog posts from other dietitians and therapists on IE and weight-neutral approaches to health. I learned that attempts to lose weight tend not to produce long-term results for most people. Intentional weight loss attempts can also lead to biological and psychological stress and disordered eating. Yo-yo dieting (weight loss and regain over and over) has been linked to heart disease, insulin resistance, inflammation, increased blood pressure, and a return to a higher weight than baseline. On the other hand, studies on intuitive eaters have shown several benefits. You can learn more about the research on the Intuitive Eating website. 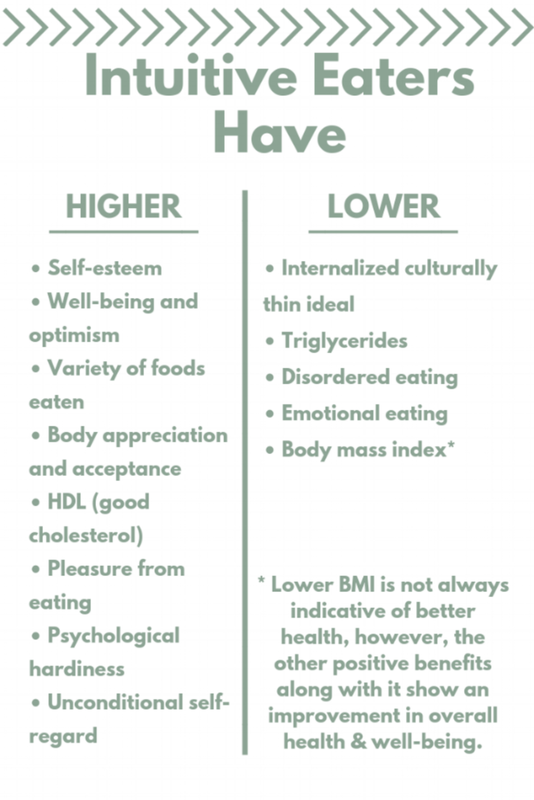 Considering the harm diets and restrictive eating can cause and the benefits that Intuitive Eating has, adopting this approach to helping people in my practice and in my own life was a no-brainer. Now I have the tools help my clients move away from the mindset that health = losing weight and adopt more sustainable practices to achieving their health goals. If you’re tired of trying diet after diet and would like one-on-one guidance to a better relationship with food and your body, I’d love to help you get started!